For those concerned about flight as a game breaker, two things should be noted. First, fly is a generally available spell by 5th level and its benefits outweigh an aarakocra's natural flight in speed and the ability to hover. Second, I have included specific (though not overly cumbersome I hope) rules that simulate how the flight of a creature with a 20 foot wingspan would be limited in day-to-day life. Aarakocra are commonly perceived as tenacious hunters, aloof and quiet, and overly serious. This perception is born from their most common interactions with other humanoid races--undermining evil organizations. 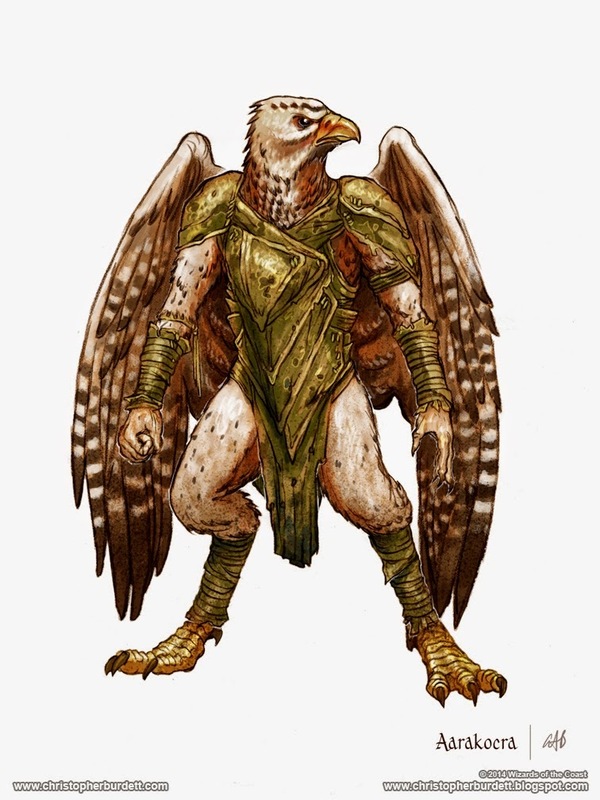 Aarakocra are staunch enemies of cults of Elemental Evil and the fiend lord Pazuzu and let very little distract them when they are close to unraveling their enemies' plans. However, aarakocra are an intelligent, kind and good-humored race whose serious nature is reserved for combating their enemies. They find little in common with most earthbound races outside of the temporary alliances against evil, but those who have taken the time to see past their differences have discovered that aarakocra make steadfast allies and lifelong friends. Most aarakocra find no need for excess wealth, believing that an individual or family should use only what they need to thrive in their chosen profession and give all excess to others, freeing them from the burdens of survival in order to better themselves. On a practical level, this means that an aarakocra with money to burn will often spend it on their friends, and even strangers, without second thought, creating both friends and enemies. Though some have been "taken advantage of" by less scrupulous humanoids, the aarakocra simply don't care. At times an aarakocra's attitude has lead those same unscrupulous humanoids to either question their own motives and make life choices for the better, or push their luck beyond the tolerance of their "benefactors". Druids of both core Circles exist (see Druids below). Aarakocra fighters are charismatic leaders skilled in working as teams (misnamed "flocks" by other humanoids), so are commonly trained as battle masters, though a variation of the eldritch knight, known as storm lords (see Fighters below), act as elite warriors and bodyguards to important leaders. Aarakocra monks are masters of maneuverability, using their wings and talons to great advantage both in the air and on the ground. They follow both the open hand and elemental traditions, though a small society of shadow monks are rumored to work for cultists of Pazuzu. Paladins are rare among the aarakocra, though not entirely unknown, and follow the Oath of the Winds (see Paladins below). 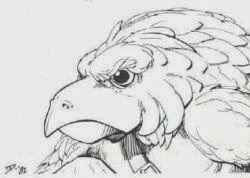 Rangers of both archetypes are common among aarakocra, tracking and destroying the Duke's enemies. Child of Aaqa. Aarakocra have advantage on saving throws against lightning and thunder damage, as well as against spells or powers that manipulate air, such as gust of wind, wind wall, or an air elemental's whirlwind power. Wings. An aarakocra's impressive wingspan allows them to fly at great speeds, but they may not hover. In order to fly, an aarakocra must have a minimum of 10 feet of open space on either side of them and 30 feet of open space above, below them or any combination (taking off from a ledge 15 feet above the ground and 15 feet below the ceiling is appropriate). An aarakocra who has been restrained, either by a spell, net, lasso, grapple or other effect may not fly. An aarakocra is also prevented from flying while wearing armor or while carrying a heavy load. At 5th level, your fly speed increases to 50 feet. Aarakocra druids that follow the Circle of the Land follow the Air Circle. The Air Circle follows the same rules as other Circles with the following changes. In addition to the core druid cantrips, you may select your bonus cantrip from ray of frost or shocking grasp. This cantrip is considered a druid spell. Aarakocra paladins follow the Oath of the Winds, a variant of the Oath of the Ancients. At 1st level, aarakocra paladins lose proficiency with heavy armor, but gain proficiency with one type of artisan's tools and one musical instrument of their choice. The tenets and features of the Oath of the Wind are the same as the Oath of the Ancients, with the exception of their oath spells and nature's wrath feature as follows. Nature's Wrath. The foe is ensnared by powerful winds instead of vines. Otherwise, the power functions exactly as the Channel Divinity power of the Oath of the Ancients. Thanks, Tim. More monstrous races to come. I don't know if you already know. 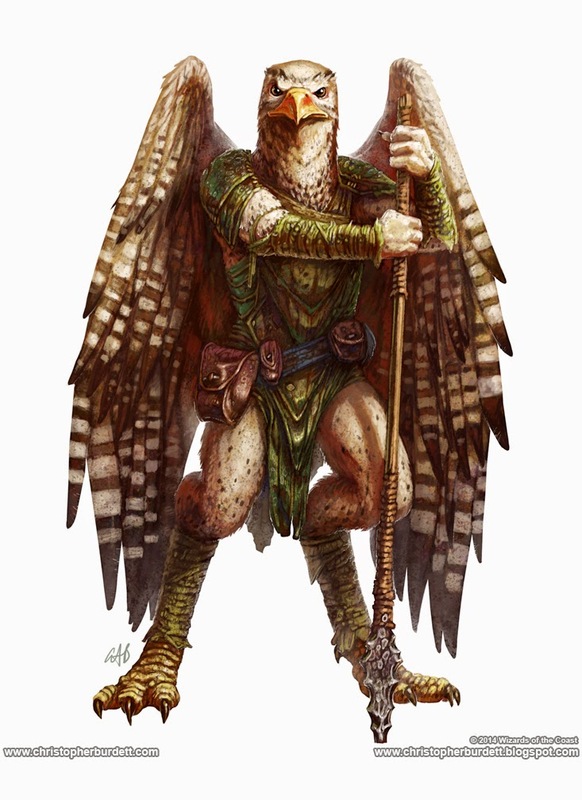 But they made the Aarakocra a playable race with the Elemental evil player's companion. Maybe you could update the traits with those of the book (for example the flying speed is 50ft). I did see that. Thanks so much for checking in. I don't actually find that version compelling. A flat 50' fly speed at 1st level with minimal restrictions is an almost game-breaking ability. As a DM, you need to really think about the choice of letting that into the game. The version I present here eventually gets the 50' fly speed at a time when the game starts to consider fly spells and such in adventure design. I also find the additional flavor abilities of this build to be more interesting. Of course, that's just me so I expect players will play (and DMs will allow) whatever works for their game. I did have an interesting conversation about considering races like this in the same way I would for an aquatic game. To have a group of flying PCs and running a high-altitude game would be fascinating, and this fly-speed issue would be moot. I actually prefer yours over the one on the player's companion! I showed this to my DM but he didn't like all the fancy stuff that doesn't come with the one on the players companion (Dive atack, keen senses and Child of Aaqa). I'm planning on playing a Rogue Aarakocra that works as a scout for the party and the keen senses trait would be REALLY helpful. Any recommendations? We have 104 points to distribute on our ability scores and we have to use sanity. I was thinking something like this STR 10 DEX 18 (+2) CON 18 INT 17 WIS 17 (+1) CHA 10 SANITY 14 but I'm not sure because I'm just a newb at D&D. BTW! I should have said this on my first comment but, thank you for this post. I had to choose between being an Aarakocra and being a Svirfneblin. But all the background information and detailed descriptions of their society and the roles they have in each class inspired me to write my own back story as an Aarakocra. Wonderful! I love hearing that. Thank you very much and I hope you have a lot of fun. Perhaps he will let you use the rogue infiltrator class. The only difference between it and the thief class is the Agile Flier ability that is a slightly tweaked version of the Monk's missile deflection feature. Inspiring and beautiful work. It's incredible how you gave me an enormous charge in playing and trying to apply some mods to races. It's a so well-written article, that you make that seem so simple and easy! Thank you so much for your work! Be sure I will surely consider to play an Aarakocra in next campaigns! That is very kind of you. I hope you enjoy the other races here and at www.tribality.com. One of my players is playing an Aarakocra Druid - thanks for this writeup! Excellent! Let me know how it plays around your table. This looks like a pretty cool race. Nicely done! Thanks so much. There is an "official" aarakocra in the recent, and free, Elemental Evil Player's Companion, but I find both the unrestricted fly speed and lack of other interesting flavor less than compelling. It was honestly random. I couldn't find a thing on their age at the time, but the Elemental PDF came out months after I posted this with the hilariously short lifespan. Just haven't bothered to change it. I would guess they have huge clutches of eggs!? Makes them ideal combat fodder for sure. Apparently in earlier editions of aarakocra live an average higher than humans (101-150 is the range given), the exception being those in Athas which live an average of 30. I think in general lifespans on Athas are shorter though.... it's a pretty brutal place. So I'd go with 101-150 for their lifespan outside of Dark Sun campaigns. The longer lifespan makes more sense though, as typically birds live longer than mammals of similar size. Even parrotlets which are tiny birds can live 15-20 years if well cared for. Agreed. Having been a parrot owner and a veterinary RN working with birds, their lifespan often takes new owners by surprise. This is really helpful! I must say I am a little confused about limb count, though. From the illustrations you have, there is depicted both an Aarakocra with four limbs (wing/arms, legs), and two with six limbs (arms, wings, and legs). Is there an official number of limbs? The original Jeff Dee art from early editions had wings+arms and legs. In the 5e version, their wings are separate. I've been contemplating an alternate build based on Jeff Dee's art where while they are flying they have very limited weapon use, likely disadvantage on all attack rolls because they use their partially-prehensile feet. To be honest, the ability to fire a bow or swing a sword while a pair of huge wings are keeping you aloft seems a stretch even for the 5e version.The biggest complaint about the flying speed from the Elemental 5e supplement is that they can be out of melee range while still firing bows at will. Limiting that would help their balance. This is awesome. I might use an Aaracockra ranger next campaign myself! Unfortunately I JUST started a campaign as a fallen incubus paladin serving the goddess of love and the god of lust, but I'll keep Aaracockra in the back of my mind for next time! I really like this a lot. Next campaign, or if I die in this one, I think I'll play an Aaracockra ranger!